Growing up in the shadows cast by two world wars, Annabelle has lived a mostly quiet, steady life in her small Pennsylvania town. Until the day new student Betty Glengarry walks into her class. Betty quickly reveals herself to be cruel and manipulative, and while her bullying seems isolated at first, things quickly escalate, and reclusive World War I veteran Toby becomes a target of her attacks. While others have always seen Toby's strangeness, Annabelle knows only kindness. She will soon need to find the courage to stand as a lone voice of justice as tensions mount. 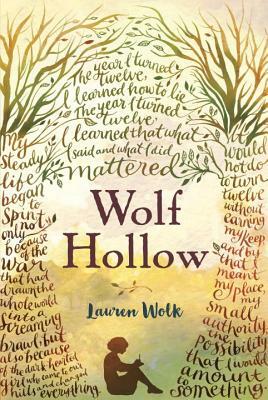 Brilliantly crafted, "Wolf Hollow" is a haunting tale of America at a crossroads and a time when one girl's resilience, strength, and compassion help to illuminate the darkest corners of our history.